Solbar is one of my favorite spots in Napa Valley, especially when the weather allows for enjoying the outdoor terrace. This recent dinner was good, but not as outstanding as other recent meals have been. 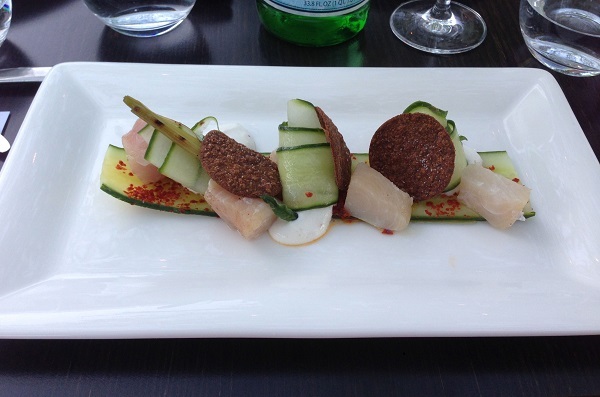 The Hamachi appetizer is unfortunately overwhelmed by the spice cure, so it is hard to appreciate the fish. We have better luck with the house made ricotta and herb agnolotti, which are tasty. 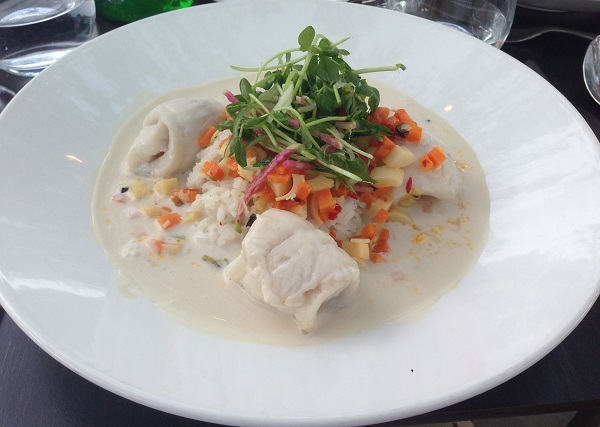 The lemongrass-poached Petrale sole with jasmine rice, pea shoots and lime is delicious, and a great example of the Solbar kitchen at its best. The flavors are bright, focused and refreshing. Solbar has a terrific wine list, including many wines that are available by the glass and/or carafe, but there is only one choice for this warm, summer-like spring evening: Champagne. The NV Cuvée de Réserve from Pierre Péters is brilliant, especially with the sole, where the vibrant Chardonnay notes complement the Asian flavors perfectly. One of my go-to, affordable Champagnes, the Cuvée de Réserve hits all the right notes. What a beautiful wine this is. Although this is not the best dinner I have ever had at Solbar, the service is exceptional, and the overall ambience is incredibly relaxing. The kid’s menu also makes Solbar a great place to go with young children, and the sundae with chocolate sauce is pretty hard to beat!